Growing up in Malibu, Calif., Kelly Hayes surfed a lot. 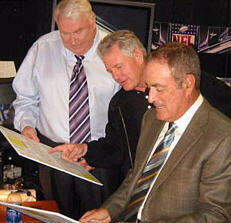 Kelly “Malibu” Hayes, as he’s been dubbed by Al Michaels on national TV for years, is Michaels’ spotter. This came about after Kelly, while a Boston University student in 1978, went to golf’s U.S. Open to research his thesis on how networks covered it. He also worked college football for Keith Jackson and Dan Fouts, but his big gig has been working with Michaels on ABC Monday night games- and following him this season to NBC’s Sunday night games. Hayes spends about 10 hours a week on his board, where stats and notes are organized, so he can point them out to Michaels. Play-by-play callers face lots of distractions- reading promos, hearing countdowns to ads- and Hayes says he’s a “second set of eyes” for Michaels. In a new wrinkle, nbcsports.com has posted Hayes’ board so it can be downloaded, printed out and pointed at so people around you seem smarter. But in your homage to a guy who’s been asked if he’s “Malibu” after introducing himself, don’t spill coffee on it.